Best race ever! This was a race Katie and I took on this morning just for fun. 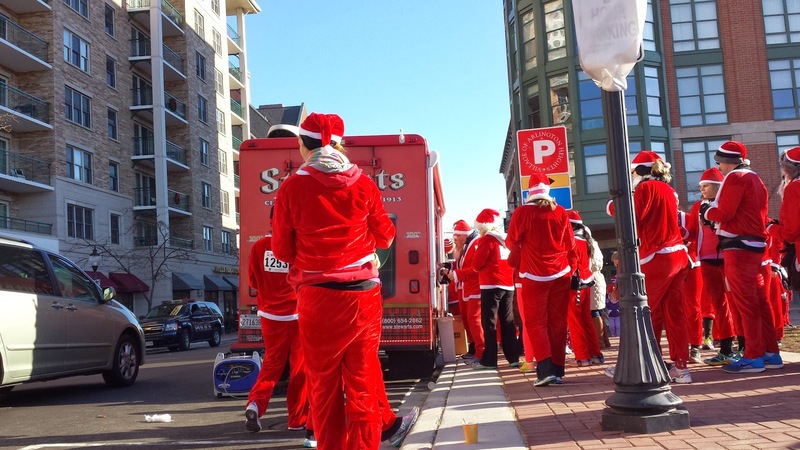 We had no set goal for the day other than to enjoy being a part of 3,000 running Santas and get in the holiday spirit. But damn was it cold. I was genuinely concerned about my circulation and wore an embarrassing amount of layers and sized up my Santa suit. That's right, we all got complete Santa suits! It included pants, a jacket, a hat, a beard and a belt. Additionally, we got a reusable tote with chapstick, a pedometer and a $2 off coupon for the hot bar at Whole Foods Kildeer. I bought a Santa suit for Tim last year and I think it was about $30, so this was a great value. 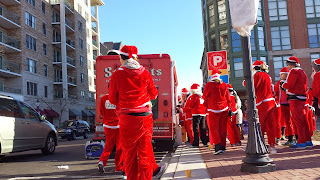 Anyhow, we wore all our layers and reveled in warming up with all the Santas. It's great that all the runners wear the outfit and the community really gets behind the race. We even saw Kim and her dad while we waited for the race to start. They were hard to find because we all looked alike! 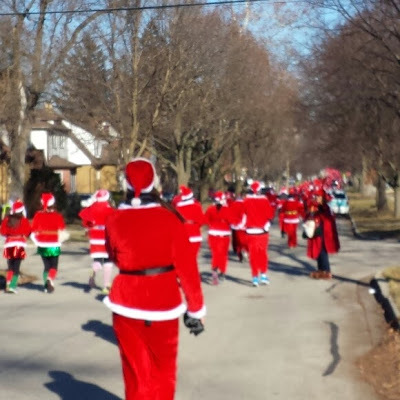 There was a gun start and we began our Santa shuffle. There were lots of people out cheering, despite the cold, and it was funny to see the pieces of our costume strewn about. It was actually pretty tough to run in the suit because the pants didn't fit well. But the beard kept my face warm. So there's that. There were two water stations on the course and in the last 1/2 mile, a middle school band was playing Christmas music. It was so awesome! We realized at the finish line that it wasn't chip timed. We went through a chute and they took our bib numbers. 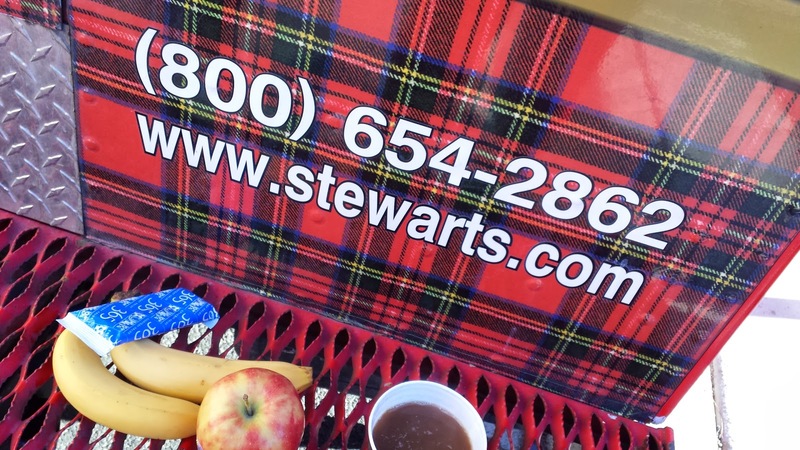 We then went through a tent with Whole Foods snackies and grabbed a cup of joe from a coffee truck! It was perfect. I loved this race, it was a blast. We had a great time seeing the sights and watching all the Santas run. I loved the family feel and the goodies. I'd totally do this race again. Note: layering and hot hands are essential for this weather! Ha ha - I like the added snow! We were wondering how they did results since it was not chip timed. Ours was really close, so they must have figured something out!